The Maui Onion Festival takes place annually in Whaler's Village, which is located in Kaanapali, Maui. This FREE Maui event has been attracting visitors for more than 2 decades as it celebrates the Kula Onion! What's So Special About the Maui Kula Onion? For starters, people use words such as "glorious" and "legendary" to describe them. Apparently this onion is so sweet that you could almost eat it raw, like an apple! Or, how about a Kula onion sandwich? Just slap together a couple of slices of bread, American cheese, and Kula onion! I don't know about you, but until now, I'd never heard of an onion like THAT! I started to wonder if maybe I could order some Kula Onion seeds and grow them for myself here at home... but no such luck. The only way to reproduce the Kula Onions is to grow them in upcountry Maui's Kula region. 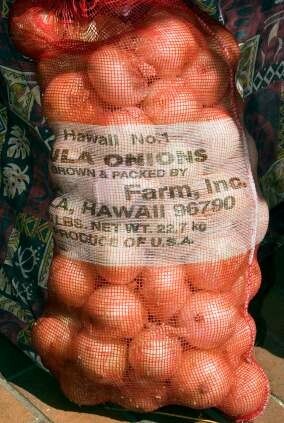 The low sulphur content of the Kula soil where they are grown is important in making the onions so deliciously sweet. Kula's cool nights are also credited with contributing to the onion's unique taste. One of the crowd favourites every year is the onion eating contest. The spectacle of a bunch of folks chowing down on RAW ONIONS is not exactly something you see every day! Although admission to the festival is free, you should bring along some cash for sampling food at the food booths. Plus, you might want to pick up a souvenir or two! By any chance have you been to this festival? If so, I'd love to hear all about it! You can share your experience with everyone here! 1) If you're thinking of attending the Maui Onion Festival, you may want to read more about the Kaanapali area where it all takes place! 2) Find out more about what Maui events are coming up on our Maui Events Calendar. I'm moving things around a bit, so you may notice some wonky-looking pages until I'm done! Sorry for the mess!